Prices are per person based on 2 adults sharing departing from London Heathrow - regional flights are subject to availability at a supplement. *Complimentary upgrade is based on selected sailings subject to change and availability. 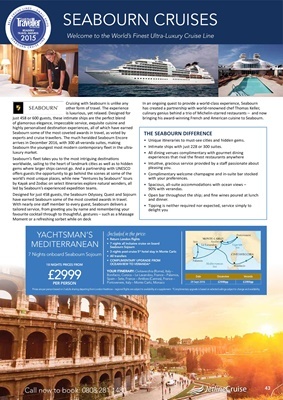 led by Seabourn's experienced expedition teams. have earned Seabourn some of the most coveted awards in travel. bringing his award-winning French and American cuisine to Seabourn. • Unique itineraries to must-see cities and hidden gems. • Intimate ships with just 228 or 300 suites.